At the core of the shamanic energy healing session lies the Illumination process. Illumination achieves healing in three ways. First, it burns up the sludge and deposits adhering to the walls of a chakra, promoting longevity and strengthening the immune response. Second, it combusts the toxic energy around harmful physical and emotional imprints. Third, it scours clean the imprints in the Luminous Energy Field (LEF). When these imprints are erased, it is possible to change negative emotions and behaviors. The power of the immune system is unleashed, and physical healing is accelerated. Every imprint in the LEF is linked to a chakra through which it releases toxic data into the central nervous system. To better understand a client’s problem, I perform a chakra assessment to determine which is the compromised energy center. In the Inka shamanic traditions there are no “bad” energies. 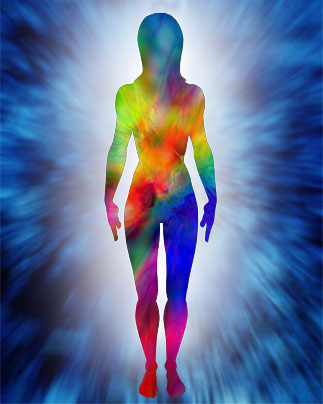 There are only energies that are “light,” and so support life, and energies that are “heavy,” which cannot be digested. The Illumination process transforms heavy energies into light, turning emotional wounds into sources of power and knowledge. Only one healing issue and one chakra should be worked on during an Illumination session. The entire process takes about an hour, and begins as described in last week’s blog. After opening Sacred Space and enveloping my client in my Luminous Energy Field, I focus on the compromised chakra. Cradling my client’s head in both hands, I hold the pressure points at the base of the skull. These points, known in acupuncture as the heavenly gate, help to bring the client into a deep state of relaxation. While holding the deepening points for at least ten minutes, I softly ask what she is experiencing. As soon as the chakra is opened, it begins to “backwash,” releasing its sludge and toxic energies. I often perceive dark streamers, like thick ribbons, swirling out of the chakra. I spin the chakra counterclockwise several times, since it can become clogged when it backwashes, and check in with my client to see how she is feeling. Some clients report a change in body temperature, or experience involuntary muscle spasms, or spontaneous jerking – signs that energies around the imprint are being combusted and expelled. I remind my clients that they can slow down or stop the process at any time by crossing their arms over their chest. Once I detect that my client has reached a state of natural resolution, I perform the Illumination. Reaching above my head with my right hand, I gather the energy of my eighth chakra and bring it down into the client’s open chakra. I visualize a radiant sun above my head and see my hand gathering scoops of sunlight and showering the chakra with this golden light. I repeat this step three times. The Illumination heals both physical and psychological conditions, overwriting the imprint with pure light. After the Illumination, I bring my hands once again to the base of the client’s occipital ridge and hold the deepening points for several minutes. This helps the client to relax while the luminous body establishes a new, healed architecture. Then, I balance the chakra by spinning it three or four times in a clockwise direction, and close my own Luminous Energy Field, gathering it back until it becomes a radiant orb above my head. I close Sacred Space after inviting my client to sit up and share her experience. Detailed information about the Illumination process can be found in my book, Shaman, Healer, Sage.